My apologies for being so slow in updating the blog. Effie’s passing has left us totally devastated, with a huge Effie-shaped hole in our lives that we are struggling to come to terms with. And if I am honest it has left my chicken keeping life without its sparkle. My girl has gone and everything seems muted and grey. I still talk to her every morning, well to her little ‘Effie’ stone anyway, which is now nestling next to Miss Basket’s on our little chicken graveyard – a sight which provides a little comfort and reassurance. But there are still nine little hens running around the garden who depend on us and are trying everything in their magical chickeny power to lift our spirits and show us how to face life without Effie. Mathematicians out there will be thinking; “I thought they had eight hens, with no Effie, that would make seven.” Well yes … therein lies a tale! When Eff was ill and inside the Human Coop, I had an email asking me if I would take on a little frizzle who was being picked on. I had no real intention of any more hens with such a poorlie girl to care for but as usual I couldn’t say no! 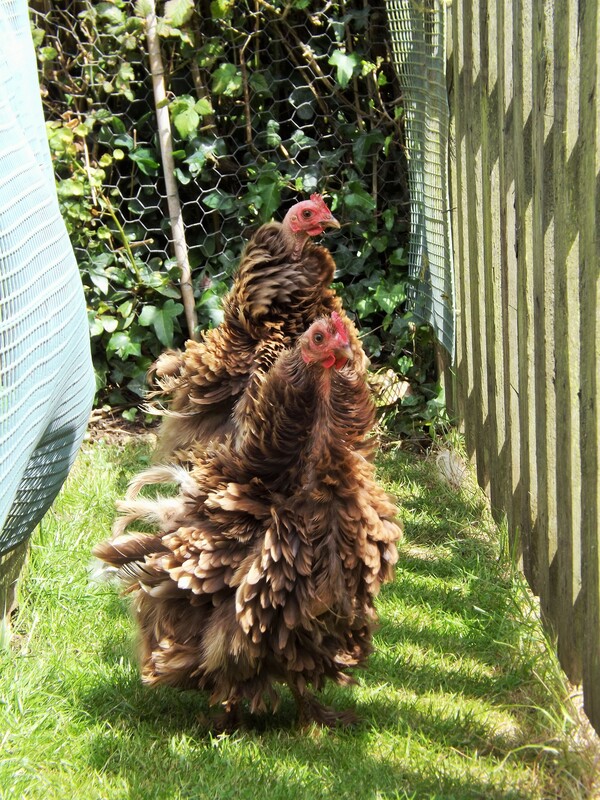 When I turned up to collect the frizzle, spookily there was a second frizzle who also needed a loving home. So two new babies came home to live with us. They looked quite a sight, bald and scraggly, so I decided they needed glamorous names. As they were from the same batch of eggs as my I girls, I decided on two I names (especially as I have many fabulous M names ready for the next batch of ex-batts whenever that will be!). So Ingrid Bergman and Iris Frizzle they became. Still flighty and scared of their own shadows they are now happily settled down in Effie’s Garden and will one day be integrated with the Big Girls. So much for our Humans’ Garden! But what about Lemony I hear you cry! Last time we looked, she was in Effie’s Garden waiting for her MummyEffie to get better. 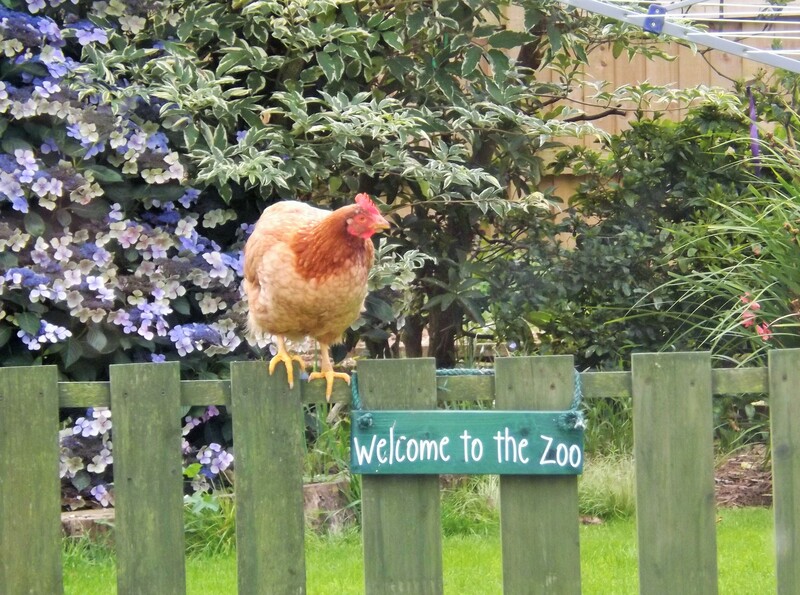 Well, hens seem to have an uncanny sixth sense – clever little things – and Iona knew something was wrong, so visited her sister Lemony in Effie’s Garden on a regular basis by scrooching under the fence. When I turned up with Ingrid and Iris, I took the plunge and popped Lemony in the Big Girls’ garden. Reunited with her bantie sisters, she was far too busy and happy to notice where she was and has settled in remarkably easily. The banties sleep in their own coop still, and there is the occasional silliness, but I am amazed at how well she has settled in. So well in fact that I now feel guilty for separating the banties and leaving Lemony with Effie. But Lemony, bless her beautiful little yellow feathers, loved Effie above all else and knew that she had an important job to do in caring for her elderly friend. But now she can go back to the task of being a naughty bantie with her sisters. And strangely, or not I suppose, ever since Lemony moved in with the Big Girls, Iona has never once gone back into Effie’s Garden. She knew, bless her. Little Lemony – officially a Big Girl now! But someone else has taken it upon themselves to pop over the fence into Effie’s Garden. 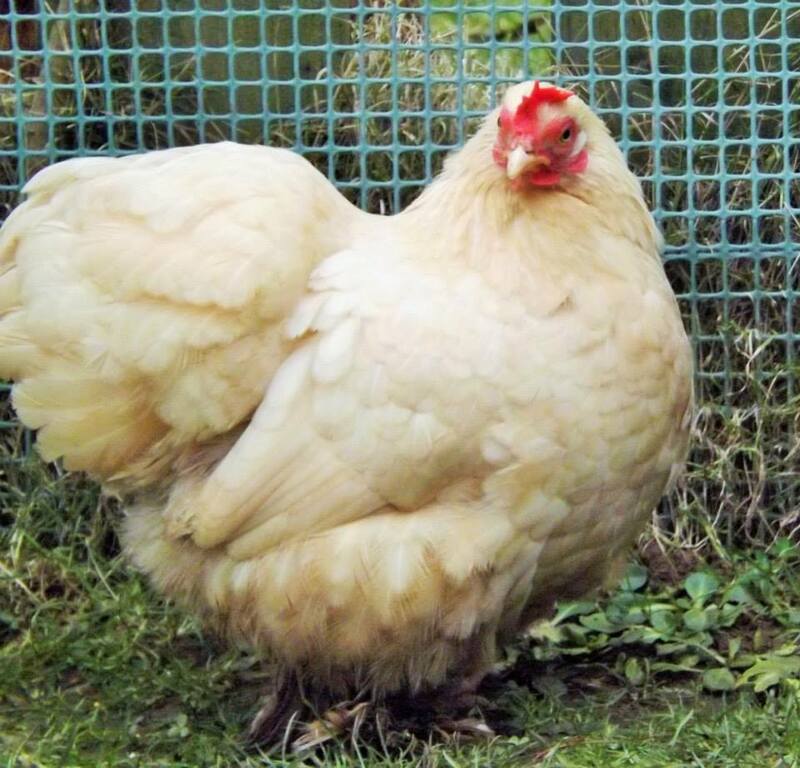 Miss Lavender Goodchicken has discovered she can fly onto the fence and hop into the other garden, hoover up the food, lay her egg, bang on the patio doors and then hop back again. Little madam. Actually, it is working rather well. Firstly I like seeing a little brown hen outside the patio doors (if I am not concentrating I can let myself believe it is Effie for a split second) but most importantly she has got on very well with the frizzles and it will help with their integration later in the year. Lavender is also terribly pleased with herself for performing this miraculous flying trick and you can’t help but laugh with her. Miss Lavender Goodchicken is very proud of herself! Which brings us finally, to our Henniversary Girl. 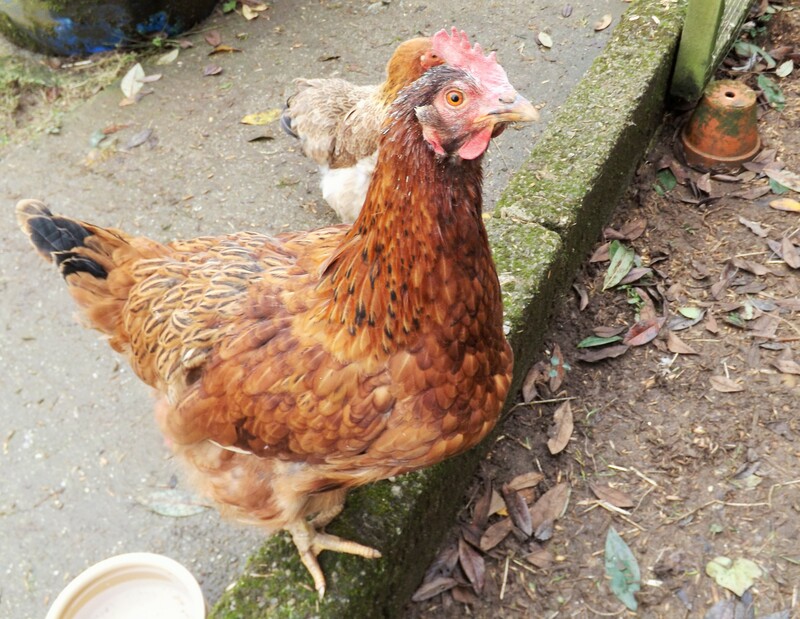 On 6th October Miss Greta Garbo Goodchicken celebrated three years as a free girl. An amazing achievement for a girl who came out with such a sore, red and swollen abdomen I thought the prognosis could only be bad. But Greta is living proof how resilient and hardy exbatts really can be. After almost two years of a bare swollen bottom, miraculously the swelling subsided and her feathers grew back. Now she is sporting a magnificent pair of knickers and a black tail that shows her Colombian Black Tail heritage. She is the happiest, sweetest and kindest girl and we are so very proud of her for being the wonderful little hen that she is. So life does go on; the girls are using their magical henny healing power and are all trying their very best to mend our broken hearts and show us there is so much more for us to do. More hens to cuddle, more hens to love and ultimately more hens to rescue. I just wish my Effie was here to help us. Sending you a big ((((hug)))) I always cry a little for your loss of Effie, I know I too will one day have to face such a devastating day with my Ivy who is 3 and a half years free, she is such a huge character in my garden 🙂 I love reading about your lovely ladies and it is true they help heal a broken heart. Unless you are a hen keeper no one can understand how these beautiful girls take hold of your heart and soul!